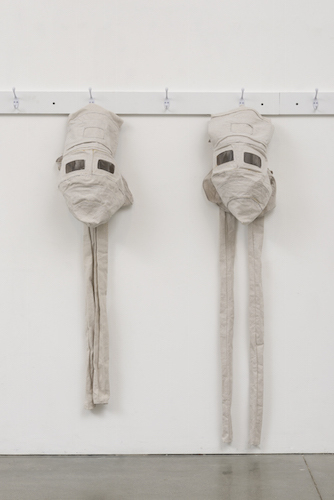 James Crosby, the Garrett Morgan safety hood allowing the wearer to breathe in a hostile environment (detail), 2015, fabricated coat/hat rack, heavy canvas, polycarbonate welding lens, dimensions variable. Canvas masks with square polycarbonate welding lens eyes and two tubes, each dangling like strange appendages, line one wall of the gallery. The masks, together titled the Garrett Morgan safety hood allowing the wearer to breathe in a hostile environment (all works 2015), are replicas of air-filtration hoods––originally conceived to protect firefighters from smoke––created by African American inventor Garrett Morgan. Here, James Crosby reinterprets them as defenses against both atmospheric and social threats. A large black-and-white photograph of a figure donning the hood highlights its capacity for disguise (Take care of your mask and your mask will take care of you). Although the gallery text affirms the wearer is Crosby himself, his face is completely obscured, making this claim impossible to verify. Crosby’s decision to frame Morgan’s legacy around this particular invention—rather than another of his innovations, such as the electric stoplight—allows the artist to engage the subject of blackness. Though Morgan symbolizes African American achievement, Crosby’s emphasis on the hoods as Morgan’s defining civic achievement seems to imply that becoming part of the Black American historical canon requires deemphasizing, or even effacing, race. A pair of hoodies cut open––one resembling a soft exoskeleton, the other concrete-dipped and hardened, like armor—emphasizes this tension between visibility and concealment. Clothing and camouflage can protect the vulnerable, though not always, as the hoodie, now a haunting symbol of police brutality, reminds us. Crosby offers no finite answers for how blackness should present itself in society or, for that matter, in art (notably, none of the pieces on view directly represents the black body). His refusal to try to neatly resolve such vast and difficult questions only makes his debut exhibition more compelling.